By Sean Jones: Heavyweight contender Kubrat Pulev is taking heat on social media for kissing a female reporter on the mouth at the end of an interview following his seventh round knockout victory over Bogdan Dinu (18-2, 14 KOs) last Saturday night on ESPN at The Hanger, in Costa Mesa, California. Pulev, 37, surprised the female reporter by kissing her on the lips just as the interview ended last Saturday. The reporter was asking Pulev about a future possible fight with fellow Top Rank boxing heavyweight Tyson Fury. Moments after Pulev let the reporter know that he’s interested in fighting Fury, he kissed on the mouth. The reporter looked embarrassed at the kiss. The surprised looking reporter then said, “Alright, thank you. Jesus Christ.” It didn’t appear that Pulev asked the reporter for permission to kiss her as the interview was ending. The reporter seemed to be good natured about the kiss, but she looked embarrassed. Top Rank inked Pulev to a contract last December. It’s believed they’ll be match him up against Tyson Fury later this year after his cut heals, and after Fury defeats Tom Schwarz on June 15. Fury signed with Top Rank recently as well. As for the fight, Pulev was struggling with the size and aggressiveness of the 6’5″ Dinu, who was taking to the fight to the older 37-year-old Pulev. In the 4th, Pulev suffered a bad cut from a punch from Dinu. At that point, Pulev started fighting hard, throwing power shots and looking to go to war with Dinu. Pulev might have recognized that there was the potential of him losing to the 32-year-old Dinu. Going into the match, this was supposed to have been a stay busy fight for the former heavyweight world title challenger Pulev. Dinu had recently been knocked out in the fourth round in his last fight by Jarrell ‘Big Baby’ Miller in November. Miller trounced Dinu in knocking him out in the fourth round. For his part, Pulev didn’t have such an easy time against Dinu. The Romanian heavyweight took the fight to Pulev, nailing him with hooks to the head. 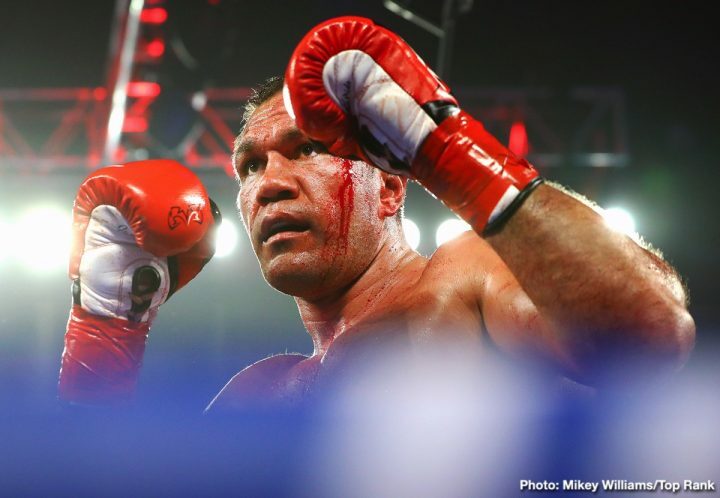 Fortunately for Pulev, Dinu lacked the power to hurt him the way Wladimir Klitschko did in knocking him out in the fifth round in 2014. In the 7th round, Pulev dropped Dinu with a shot, and hit him while he was down. This resulted being penalized a point for the foul. Dinu got back up, and was knocked down twice before the fight was halted. Referee Raul Caiz Sr. stopped the fight at 2:40 of the seventh.